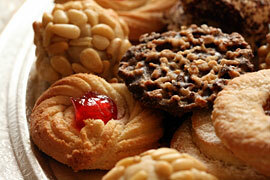 Authentic Italian Pastries, Cookies & Breads. Pizza, Panini & Entrees. Freshly Made Pasta. A Taste of Italy is Just Around the Corner. Nestled among the side-streets of the historic Old Uptown neighborhood of Harrisburg there sits a corner shop of culinary delights; a place where carefully preserved Old World recipes and imported ingredients come together as freshly-made Italian breads, desserts and pasta. Alvaro's Bread and Pastry Shoppe brings an authentic taste of Italy home to Central Pennsylvania. Come inside and enjoy! Made with authentic ingredients imported from Italy, Alvaro's is proud to announce our new hand-made Gelato is here. Enjoy any of our 15 flavors on your next visit, or take some home!